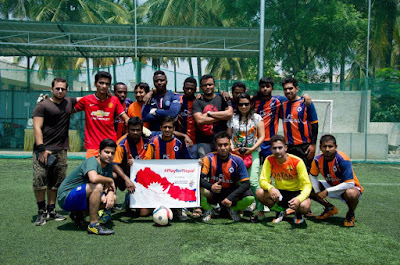 8 teams battled out on a knock-out basis to determine the champions of the Community Cup 2015, an 8-a-side daylong tournament organized to raise charity for the Nepal earthquake disaster. Finally FC Bengal got the better of ATK Fan's Club, Bengaluru and lifted the Community Cup 2015. Player of the Tournament was awarded to Utsav of ATK Fan's Club while Kenny of FC Bengal took away the Best Goalkeeper prize. The event was played at Kicks on Grass, Bellandur and was broadcasted live over the internet via www.beamitlive.com/loveforthegame. The cause was supported by the reigning ISL- Indian Super League Champions Atlético de Kolkata! The organizers, Love for the Game, did not charge any participation fee for this tournament. Rather participating teams pulled money in the form of cash/cheque and handed over to the organizers on the event day. The organizers, Love for the Game, will donate the same amount to the cause of Nepal earthquake relief.